In general, cellular adaptation is a potentially reversible change in response to the environment. Atrophy is a decrease in cell/organ size and functional ability. Causes of atrophyinclude decreased workload/disuse (immobilization); ischemia (atherosclerosis); lack of hormonal or neural stimulation, malnutrition, and aging. Light microscopic examination shows small shrunken cells with lipofuscin granules. Electron microscopy shows decreased intracellular components and autophagosomes. 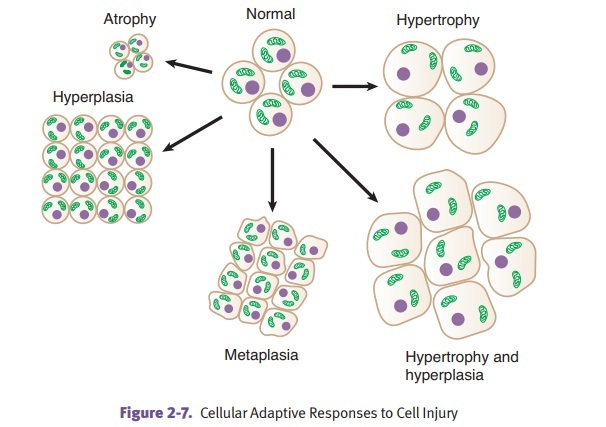 Hypertrophy is an increase in cell size and functional ability due to increased syn-thesis of intracellular components. · Increased mechanical demand can be physiologic (striated muscle of weight lifters) or pathologic (cardiac muscle in hypertension). · Increased endocrine stimulation plays a role in puberty (growth hormone, androgens/estrogens, etc. ), gravid uterus (estrogen), and lactating breast (pro-lactin and estrogen). Hypertrophy is mediated by growth factors, cytokines, and other trophic stimuli and leads to increased expression of genes and increased protein synthesis. Hyperplasia is an increase in the number of cells in a tissue or organ. Some celltypes are unable to exhibit hyperplasia (e.g., nerve, cardiac, skeletal muscle cells). · Physiologic causes of hyperplasia include compensatory mechanisms (e.g., after partial hepatectomy), hormonal stimulation (e.g., breast development at puberty), and antigenic stimulation (e.g., lymphoid hyperplasia). · Pathologic causes of hyperplasia include endometrial hyperplasia and pros-tatic hyperplasia of aging. Hyperplasia is mediated by growth factors, cytokines, and other trophic stimuli; increased expression of growth-promoting genes (proto-oncogenes); and increased DNA synthesis and cell division. Metaplasia is a reversible change of one fully differentiated cell type to another,usually in response to irritation. It has been suggested that the replacement cell is better able to tolerate the environmental stresses. For example, bronchial epithelium undergoes squamous metaplasia in response to the chronic irritation of tobacco smoke. The proposed mechanism is that the reserve cells (or stem cells) of the irritated tissue differentiate into a more protective cell type due to the influence of growth factors, cytokines, and matrix components.